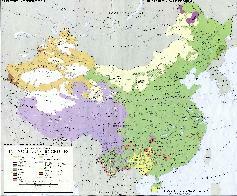 China is a multi-Ethnic Society dominated by the Han Ethnic Group. According to a National Census held in the year 2000 there are currently 56 Ethnic Groups living within the Borders of the Peoples Republic of China. The Total number of Citizens in China, according to the census was 1265.86 Million, excluded Hong Kong, Macau and Taiwan. Of these Ethnic Groups the Han are by far the most numerous, totalling around 91.6 % of the total population of China (P.R.C.). 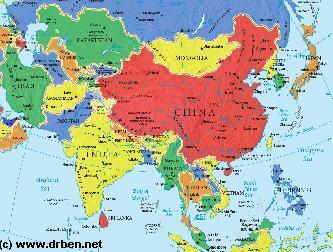 Accordingly, the other 55 Ethnic Groups in China account for about 8.4 % of the population, or 106.43 million people. Compared to the National Census of the year 2000 there was a 13.5 % increase in the rise of members of another Ethnic Group then the Han. The Ethnic Minority Population rose by 23 million between 1990 AD and 2000 AD. The populations of a number of Ethnic Groups rose, the Gaoshan, The Qiang, the Maonan, Bonan and Tujia populations rose by about 40 %. Few Ethnic Groups did not experience growth. Already marginalized, the Uzbek (Xinjiang-Uygur AR) population shrunk further, by 2300 persons of 15.000 in total and the small Tatar population of Xinjiang-Uygur Autonomous Region lost a 170 souls (of 5 to 6000 in total). The Second Ethnic Group in China are the Zhuangs. Only residing in Southern China, the Zhuang Population measures 16178.800 million Souls. Mainly residing in the Guanxi (Zhuang) Autonomous Region of China the Zhuang can further be found in Yunnan, Guangdong, Guizhou and Hunan Provinces. The Third are the Manchu, originally from North-Western China's Manchurian Region. Fourth are the Hui, the first and largest Islamic Ethnic Minority of China. The Hui can be found all over China where they mainly engage in trade. They are further described among the Islamic Ethnic Groups. The Ethnic Groups of (mixed) European Blood are the Russians , the Tatars and the Tajiks. Almost last on the list, measuring just some 300.000 people, the Goashan are not, as yet, in practical terms an Ethnic Minority of the Peoples Republic of China as they are mainly found on the island of Taiwan. Only 4.500 Gaoshan live on the Chinese mainland. The Gaoshan are the aboriginal inhabitants of the island of Taiwan and are counted as native to the PRC by its Government for political and historical reasons. The Gaoshan descend from large immigrations by Han People to Taiwan Island in the 17Th Century. The Gaoshan mainly live in Tribes in the mountainous central region of Taiwan, the Zhongu Plain of East Taiwan and at Langyu Island where they used to live in primitive societies of hunting and fishing. The Gaoshan in the Zhongu Plain are still active in practice farming, however most have joined modern society. The number of Gaoshan rose by about 40 % since 1990 AD. The other Ethnic Minority of Taiwan are the Tayal or Atayal people. The smallest and most endangered Ethnic Group are the Lhoba who originate from Tibet Autonomous Region of China. These colorful people now count only a few. They can be found only in the South-West of Tibet where they traditionally live of farming, hunting and gathering. Although encouraged by the Central Government and provided with roads and schools they have a still primitive society their own language and natural and animalistic beliefs. (Created by Xinhua.Net for the Chinese Government). Since the establishment of the Peoples Republic of China and the identification and inclusion of the 36 Minority Groups the Chinese Government has implemented a system of Ethnic Affairs through which the Minorities can be supported in their development in various ways, while their cultural identity, way of life and folklore. This system has been chosen for historical as well as practical reasons. The main pillar of this system provides many minorities with their own homelands in the so-called Autonomous Regions and Prefectures of China. In these Autonomous Regions self-government has been established to ensure the autonomy of the ethnic groups, albeit under ultimate sovereign authority and supervision of the Central Government. In October of 1936 AD, the first such Autonomous Enclave established in the history of Communist China was established. This was the Yuwang Hui Autonomous Government located in Southern Ningxia Region, which although short-lived did provide the idea and experience that formed the basis for the later country wide system of Autonomously administered regions. Sadly due to Political Machinations and Mass Upheavals such as the Cultural Revolution, this plan has not always succeeded as is pointedly demonstrated by the case of the Tongxin Grand Mosque. Due to the fact that the first autonomous ethnic enclave Yuwang Hui Autonomous Government, was established inside its main prayer hall in October of 1936, it was protected as a revolutionary historical site, and so became the only Islamic Mosque in Ningxia to survive the destruction of the Cultural Revolution (1966 AD - 1976 AD). All other Mosques in the wide region were destroyed along with a large number of Buddhist shrines, Temples and Monasteries. Contrary to all the fancy promises of the Central Government, their was no autonomy, no freedom in religious affairs and no respect for minority cultures. The Ethnic Nationalities were expected to grow up and modernize. Cooperate, not contradict. Autonomous Regions and enclaves that suffered especially are located in Qinghai Province (East Tibet) which has many autonomous counties and prefectures, Tibet Autonomous Region, Ningxia Hui Autonomous Region and Xinjiang-Uighur Autonomous Region. Each minority has its own history to tell. In many cases mistakes have been offcially recognized by the Government. In many other cases though complaints have been ignored outright. After several decades of mis-management of ethnic autonomy issues, a new Political wind in the aftermath of the Cultural Revolution did result in the reversal of some Policies. Mistakes were named and corrected. In 1984, China enacted the Law on Regional Autonomy for Ethnic Minorities, providing the rights and duties of the regional self-government in Autonomous Regions in political, economical and cultural fields. This provided a new and clear National legal cadre through which the Minorities could claim and exercise their rights, as well as work with the National Government for their development and cultural needs. In 2001 AD amendments were accepted to further enhance this Law. Many amendments relate to the economic field of development however. Since the year 1985 Ethnic Minorities have seen more freedom of movement and the re-establishment of their cultures. Many Temples and Mosques have been reopened. Ethnic Festivals are celebrated openly and with abundance, drawing visitors from far away. There are currently five autonomous regions in China. These are Inner Mongolia Autonomous Region, Xinjiang-Uygur Autonomous Region, Tibet Autonomous Region (Xizhang), Ningxia Hui Autonomous Region along the Yellow River and Guangxi Zhuang Autonomous Region in the South of China. Apart from these large autonomous regions there are several autonomous counties and prefectures, which have been designated by provincial or autonomous governments and since the 1990's were all approved of by the Central Government Legislatory. Today there are 155 autonomous area's within China designated for the Ethnic Minorities. These are the 5 Autonomous Regions and 30 autonomous prefectures, 120 autonomous counties (banners). Tibet, Xinjiang, Guizhou and Yunnan, and less Gansu Province and Sichuan are especially well-known for their ethnic minority autonomous prefectures and counties, drawing many tourists each year. Of the 55 minority ethnic groups 48 are blessed with their own autonomous area's and 75% of the Ethnic Population lives within these zones. Together they make up 64% of the entire geographic surface area of China as a Nation. Autonomous Area's can be divided into five main groups. First and foremost are regions based on a compact community of one ethnic group. The easiest examples of these are Tibet, Xinjiang-Uygur and of course Guangxi Zhuang Autonomous Regions, but on a lower level there are many more. Second are the autonomous regions based on the majority population of two ethnic groups. Examples of these are the Haixi Mongolian Autonomous Prefecture in Qinghai Province and the Tibetan Autonomous Region of Qinghai and another the Taxkorgan Tajik Autonomous Prefecture near Kashgar in Xinjiang AR, which has a majority Tajik Base, but however is home to a considerable section of the Kirghiz Minority as well. Especially the entrance to the Wakhan Corridor within Chinese territory (the so called Wakhan Peninsula), leading due West out of Kashgar has been populated with Kirgiz herdsmen. Third in line are the autonomous regions based upon the majority population of several minority groups, such as Longsheng Ethnic Autonomous County within Guangxi Zhuang Autonomous Region. Fourth are the autonomous area's consisting of several ethnic minority communities located geographically together within an autonomous region, such as Gongcheng Yao of the Yao Minority in Guangxi Zhuang Autonomous Region. Fifth and Last are the autonomous regions based upon a majority ethnic population that is scattered nation-wide in smaller and larger communities. Example in case are the Linxia Hui Autonomous Prefecture in Gansu Province, but Ningxia Hui Autonomous Region also ranks in this Fifth class. One of the most recent autonomous Townships to have been established is the Nanyi Lhobao Ethnic Township in Mainling County, Nyingchi Prefecture In Tibet Autonomous Region. The Lhobao Ethnic Township with its main settlement at Caizhao Village is the new official home of China's smallest minority, the Lhoba people, of which the Yidu and Bo'gaer are separate tribes. Nanyi Lhobao Ethnic Township was established and recognized by the Central Government of the Peoples Republic of China in 1988 AD. ethnic minorities live together in close-knit, often secluded communities with their own customs, rules and beliefs. Together these facts call for a comprehensive approach to ensure the equal participation of all minorities, even the small, under a larger system of one Government. whole, the transformation from rural and agricultural to modern, industrial, educated and city bound citizenry. The Pull of the City is mainly felt by the younger generations throughout China, who are leaving the farms en masse, leaving parents with little economic future. In the process of City Migration many members of ethnic groups leave the protection of their enclaves, venturing out to the larger cities across China. In the process of city integration new influences are met and ethnic identities are changed irreversibly. Although new ethnic enclaves are formed, mainly in such big Cities as Hong Kong, Shanghai, Qingdao and Beijing, factors such as inter-marriage and loss of traditional customs reduce the minority cultures of China and see them endangered by final assimilation with the majority Han Culture. One good if not "model" example of such woes is found at the Yanbian Korean Ethnic Autonomous Prefecture in Jilin Province of China. Due to their relatively recent arrival, high standards of education and other factors, Korean Ethnic Minority Women have the lowest fertility rate in China (around 1.05 per female/life) which combined with large scale city migrations of the educated young have drastically reduced the number of Ethnic Koreans in China, and eroded their long standing population majority inside Yanbian Prefecture. The local and central Governments are frantically trying to create a solution to this basic and far reaching problem by investing large sums in infra-structure projects in an effort at mobilizing local industry, creating new jobs for those seeking to stay in their native area's. The effects of this campaign are still awaited, however - depending on area the results have been promising. Not only has the boom in tourism industry created new jobs and industrial markets for minority products, on a far larger scale government investments have reshaped the economic landscape in previously remote and poor ethnic minority area's bringing benefits for all.